1. What services does DMHC provide? DMHC delivers a more extensive array of clinical services in the patient’s home than the vast majority of office-based primary care practices provide in their office. In addition to comprehensive clinical evaluations and medication management services, we offer full laboratory testing and imaging services (except CT and MR) onsite in the patient’s own environment, including independent and assisted living communities (ILFs & ALFs), continuing care retirement communities (CCRCs), and of course private residences. We also arrange and supervise skilled nursing care, physical therapy (even daily, if indicated), occupational therapy, wound care, and infusion services, including daily IV antibiotics for patients with a PICC line. The DMHC team provides complete care coordination across all venues and levels of care. We consider case managers, discharge planners, social workers, assisted living staff, and family caregivers integral and important members of our healthcare team. We also arrange and coordinate care with medical subspecialists, home care services, respiratory therapy, and medical device and equipment delivery. 2. 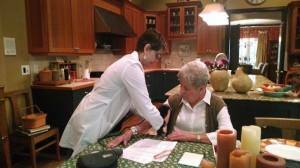 How does partnering with DMHC benefit my post-acute patients? We see our patients within 48 hours of discharge from the hospital, and follow-up as often as needed to avoid crises and ensure they are safe and stable in their own environment. We also respond immediately to urgent care needs. The net effect of our unique strategy is dramatic reductions in unnecessary emergency room visits and readmissions, even for the most complex patients at highest risk for readmission. And, as a result of DMHC’s participation in several demonstration programs, including CMS’s pioneering Independence At Home Program, we have significant and compelling data documenting our track record in reducing unnecessary resource utilization and costs, including emergency room visits and readmissions. We are also expert at diverting admissions away from the SNF/rehab facility, which has perverse incentives to send patients back to the hospital, and instead to the home or assisted living facility, where DMHC clinicians can provide the care needed to restore the patient to their pre-hospitalization baseline as efficiently as possible. Our approach is proactive – fully focused on keeping patients stable in their ALF or private residence and out of SNF/Rehab facilities, where the risk for readmission is highest. The ONLY reason to refer a patient to a rehab hospital or SNF is if the patient requires 24-hour nursing care. 3. How is partnering with DMHC a benefit to me and to my institution? As a Case Manager or Discharge Planner, you determine a patient’s path for post-acute medical care. DMHC understands and supports your dual responsibilities – first and foremost to advocate for your patients and ensure they achieve the best clinical outcomes possible, while also serving the best financial interests of your institution. DMHC enables you to fulfill those commitments, entirely without compromise. DMHC fully supports the Transition Team in its efforts to ensure the inpatient stay is not extended unnecessarily and to facilitate movement to the next level of care. 4. How does DMHC interact with my hospital-based personnel? DMHC’s patient and provider support teams, based out of our headquarters office in Durham, NC, are comprised of highly motivated individuals from multiple clinical and administrative disciplines, who provide hospital personnel and our own clinicians with an unrivaled level of customer service. Our support personnel also provide exceptional customer service to our patients and their caregivers. For example, our office is open from 7 am to 6 pm, Monday through Saturday, with more limited hours on Sunday, and a DMHC physician is on call and available 24/7 for urgent care telephone consultations and orders, with real-time access to our state-of-the-art Electronic Health Records. Transition Team professionals have direct access to any member of their support team. For contact information, please consult our staff directories or clinician pages. 5. How do I contact DMHC to learn more? Can I schedule a DMHC representative to present the benefits of your program to the transition team professionals at my institution? We’d love to meet with you! To learn more about how DMHC can work with you to reduce unnecessary emergency room visits and 30-, 60-, and 90-day readmissions, call us at 1-844-932-5700 or email communityrelations@doctorsmakinghousecalls.com to schedule a visit from one of our Community Relations team members. 6. How do my patients become new DMHC patients? Call Our Office: Register by calling our office and speaking with our new patient registration team. To expedite the process, please have your insurance information handy when you call. Toll Free (844) 932-5700 or (919) 932-5700. Register Online: Register by clicking the Online Registration link and filling out the online forms which, when complete, can be sent electronically, securely and directly to our office. E-mail, Fax, or USPS/”Snail” Mail: Click the Registration Form link and ABN Authorization link, complete the forms, and email, fax, or mail them to our office. The email for our new patient registration team is: newpatient@doctorsmakinghousecalls.com and our new patient registration fax is 919-724-4951. 7. Will we always have the same team of clinicians servicing our patients? Yes. We schedule the same clinicians for each facility or residence unless the clinician is out of town and patients need to be seen on an urgent basis. In that case, we will arrange for you to be seen by another of our outstanding physicians, who will have the benefit of your complete medical record at his or her fingertips. 8. What if a patient needs a visit after hours, on the weekend, or on a holiday? 9. What is the “trip fee”? When seeing patients in a private residence, DMHC charges a trip fee of $95 to cover the opportunity cost of the clinician’s travel time. This fee is not covered by insurers because they harbor the mistaken notion that physicians make home visits for the patient’s convenience, and they do not pay for services provided for the patient’s convenience. Our trip fee is really just another type of copay, comparable to the higher copay incurred when a patient goes to an urgent care center or emergency room or visits certain specialists. The hospital can opt to pay our trip fee, to ensure that DMHC clinicians visit the patient as often as medically necessary during the first 30-days following discharge. It is rare that more than 1 or 2 home visits are needed during that timeframe to keep patients stable and recovering briskly. However, for patients living in one of the over 200 senior living communities DMHC serves across the state, we waive our trip fee when our clinicians see patients on our regularly-scheduled visit days, which are typically twice a week. 10. What types of insurance does Doctors Making Housecalls accept? All Military Insurance, including Tricare and Tricare for Life. All Private Insurance (with the exception of Duke Select, which excludes physicians who are not Duke employees). DMHC will also file all of the patient’s insurance claims, including all secondary insurance for any charges that are not covered by a patient’s primary insurance. Please see our Insurance page for additional information on coverage. 11. Do you accept all Medicare Insurance Plans? We accept “traditional” Medicare and all Medicare Advantage Plans, as well as Medicaid and Tricare. Not only do we accept Medicare, we also “take assignment” which means Medicare beneficiaries do not pay at the time of service and don’t have to file any paperwork. We bill Medicare directly and accept their payment, which is 80% of the “allowable” charge. The 80% rate is the same whether the visit takes place in an office setting, home or business. The remaining 20% of the allowable charge is “patient responsibility.” Most of our patients have “supplemental” insurance (also called “secondary” or “Medigap” coverage) which pays some or all of the 20%. It may also have a deductible which is the patient responsibility. DMHC also bills all secondary insurance plans directly. Please see the insurance section of this website for additional details.